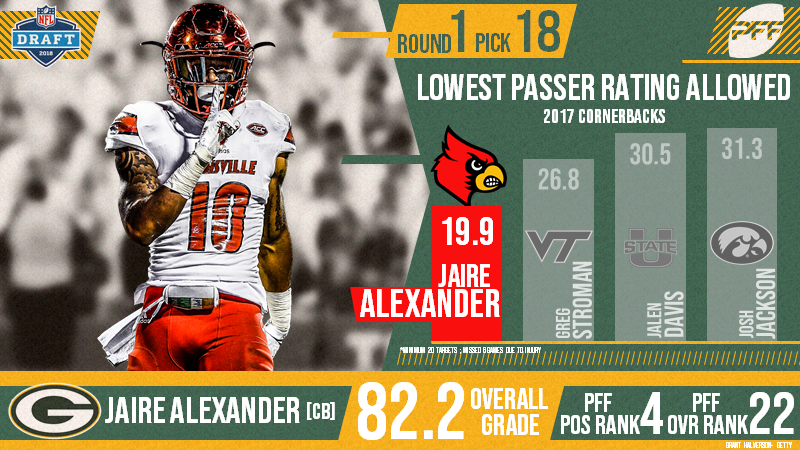 With the 18th selection of the 2018 NFL Draft, the Green Bay Packers have selected Jaire Alexander. The former Louisville star was selected 18th overall after finishing the 2017 season with an 82.2 overall grade. Seattle sent Round 1 (18) and Round 7 (248) in exchange for Green Bay’s Round 1 (27), Round 3 (76) and Round 6 (186). Alexander allowed just 46.7 percent of red zone passes to be caught in 2016, 45.3 percent over his career. Despite an injury-plagued season in 2017, he allowed a passer rating of just 17.7, and picked off or broke up more passes (six) than he allowed to be caught (five).